Elizabeth Koch learns about DIY kraut, pickles and other effervescent goodies in a jar. “You really need to get in there and work it!” my new drill sergeant exclaims. I’m elbow-deep in cold cabbage at the Boston Fermentation Festival, kneading my way towards tangy greatness with the Kraut Mob Station, a hands-on, instructor-led sauerkraut tutorial. Spread across the Boston Public Market, professional fermenters and at-home enthusiasts converge on the Festival, packing in to lecture rooms and scoping out the latest cookbooks. Me? I’m here for the food—and a crash course in DIY fermentation. Most people know the basics of fermentation, if only from an unfortunate food-storage mistake. The focus of this festival is on lacto-fermentation, a process where lactic acid bacteria forms and breaks down the glucose in a food, while simultaneously encouraging the development of pro-biotics and inhibiting the growth of “bad” microbes. All you need to jumpstart this process on vegetables is a ratio of 1.5 percent salt and some elbow grease to knead the ingredients and create a brine. Pack it all up, submerging the solids in brine, and leave it on the shelf for about five days. Voila! Fermented vegetables! Of course, we all have pre-conceptions about fermented products. Talk about Kimchi or Sauerkraut and many people might sympathetically wrinkle their noses. However, any umami lover knows that fermentation is where it’s at. “Fermentation brings out unique flavors that you can only get through this process,” Jeremy Ogusky affirms. As the public face of Boston Ferments, the local, volunteer-based organization that arranged the Festival, he would know. Soft-spoken with a relaxed but witty demeanor, Ogusky primarily works as a studio potter, combining his two passions in the shape of aesthetically pleasing fermentation crocks. He co-founded Boston Ferments about three years ago, when he and his friends found themselves organizing an increasing number of events and classes for the general public. This year marks the first time a festival is held outside of Jamaica Plain. “Moving to the Boston Public Market seems like a great opportunity to bring the festival to a wider audience,” Ogusky explains. It certainly seems to have worked. Market patrons join the Festival attendees thronging around vendor carts and overflowing out of the lecture sessions. While part of this popularity can be attributed to an interest in the many potential health benefits and consumer curiosity, there is no denying that the food is the main attraction. Creative, small-business fermenters from New England sell much more than the standard kraut or pickles—although those remain two very popular products. My favorite vendor, Real Pickles, is based out of Greenfield, Massachusetts. If cabbage isn’t your thing, this company has got you covered. Spicy and addictive ginger carrots, fresh tomatillo hot sauce, and earthy beets round out the usual suspects on this company’s fermentation roster. And then there’s Kvass, one of the more versatile product offerings. Blood-red and slightly effervescent, this tangy fermented beet juice is frequently consumed as a refreshing beverage in Eastern Europe. While the Real Pickles folks confirm that this is a great way to go, they also recommend using Kvass as a vinegar substitute in homemade salad dressings or as a flavor additive in borscht. Have a recipe that needs an earthy tang? Add Kvass. For those looking to move beyond the usual salad and creatively incorporate fermented foods into more of their meals, author and self-proclaimed fermentista Kirsten Shockey offers an amazing cookbook, Fermented Vegetables: Creative Recipes for Fermenting 64 Vegetables & Herbs in Krauts, Kimchis, Brined Pickles, Chutneys. Appearing as a guest lecturer, her talk touches on dos and don’ts of at-home fermentation, utilizing the catchy slogan, “submerging in brine conquers evil every time.” Shockey encourages us to think of these foods like any other ingredient in our kitchen arsenal and play around with flavors, experimenting with different types of produce. Her book offers tons of original recipes like a lemon dill kraut cream cheese—which I can confirm is spectacularly tasty—or an old-fashioned cocktail that incorporates a fermented cranberry relish. While the lectures and suggested recipes definitely inspire the creative juices, the real motivator is how easy all of this seems. Most ferments incorporate few ingredients and the process is pretty straightforward. Stable temperatures and dim lighting help ensure consistent results, but a root cellar is hardly necessary—glass mason jars and a kitchen towel to block direct sunlight are all you really need. Although several novices attending the lectures express a fear of inadvertently poisoning their family, we are assured that this is highly unlikely. Shockey’s book contains handy photographs displaying normal ferments, as well as experiments gone awry. While those with experience explain that the human nose will know if your pickled peaches have gone bad, there are tons of local opportunities to learn about fermentation in a controlled setting. 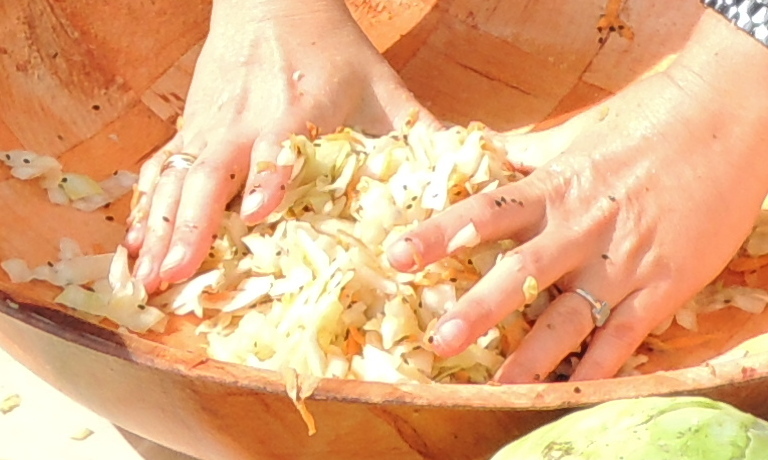 Boston Ferments hosts regular workshops and "Kraut Mob" sessions through their website, while the Cambridge Center for Adult Education offers a three hour fermentation tutorial. If DIY is not your scene, lacto-fermented products can be found in the refrigerated section at most Whole Foods, local natural foods stores, or direct from the vendors themselves. However you end up consuming fermented foods, your tingling taste buds will thank you.